In 1983, Bud Riley and a group of Canadian journalists traveled to Isreal at the invitation of the Israeli News Reporters Association. With Bud was fellow Toronto radio reporter was Kim O'Hare from CKEY. Kim started his radio career at CJKL in Kirkland Lake in the mid 60s. He piled up experience at CKWW in Windsor, CKCW in Moncton N.B. and CHEX in Peterborough. In 1976 he became news director at CKSO in Sudbury. After short stints at CFGM Richmond Hill and CHFI in Toronto, he became a respected news reporter at CKEY in 1979. 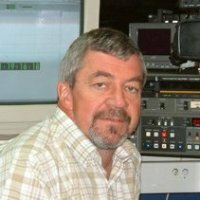 He left 'EY in 1985 and went to Canadore in North Bay as a faculty member and coordinator of Journalism Programs. Beginning in 1996 Kim spent eight years working in Dubai. He returned to Canada in 2004 to teach media at Camosun College in B.C. and signed on part time with CFAX in 2007. In 2012, the college cancelled the broadcast programme. Kim then took a public relations job at the Ministry of Transportation. From there he became Chair, School of Media at Seneca College but after a few months in that post he was recruited by 740 Zoomer Radio in Toronto to join their news department.